Since 1996, BirdLife Australia and the South-eastern Red-tailed Black-Cockatoo Recovery Team have coordinated a range wide count for the endangered South-eastern Red-tailed Black-Cockatoo across south-western Victoria and south-eastern South Australia. This involves coordinating volunteer search groups to conduct searches for Red-tails across more than sixty annual sites in stringybark habitat from Keith to Mount Gambier in South Australia and Little Desert National Park to Nelson in Victoria. Many landholders who have remnant stringybark on their property also participate by searching their own land on the day. Information gained from the annual count is used to determine the location of large flocks, patterns of habitat use and the minimum population size. This information allows us to complete our annual flock counts, which provide us with an indication of breeding success. The annual count also raises awareness of the specialised needs of the cockatoo and offers volunteers a chance to become involved in recovery activities. The annual count is held over one day in May each year (usually first Saturday in May). During autumn and winter, Red-tails will often form large flocks ranging from 50 to up to 500 individuals. 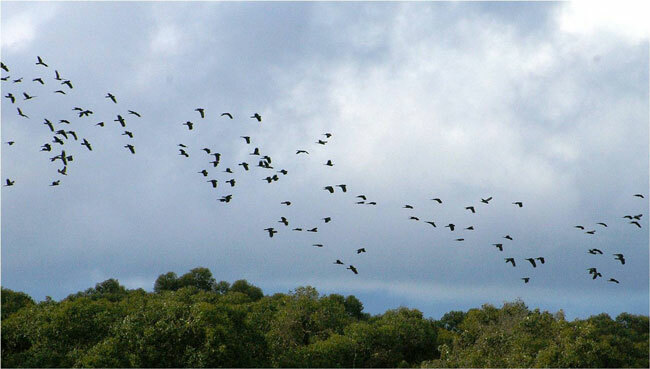 It is during this time that we are more likely to obtain a greater count of birds than compared to counting over spring and summer (breeding season) when the cockatoos are more often in pairs or small family groups. The next annual count will be held on Saturday 4 May 2019. Volunteer search groups are allocated a site in stringybark habitat, within the range, to search for the cockatoos. Landholders who have stringybark on their property are also encouraged to register and search their own land on the day. Participants can request a particular area to search upon registration, or nominate to search their own land. Almost all of the search areas (except for those searching their own land) will be located on public land. ‘Drive in the Park’ – which involves driving slowly (10kph) and quietly around your site with the windows down listening for birds and looking for signs of feeding. If feeding signs are found, volunteers are asked to stop regularly until the birds are located by sound. If birds are observed, counters are asked to count and record the total number of birds seen and where possible identify the number of males compared to barred birds (females and juveniles). Volunteer counters are also asked to record the time and location (grid reference) as to where the birds were seen. Sometimes volunteers will be asked to flush the birds into flight to gain a better count. Surprisingly, Red-tails blend well into their stringybark habitat. There are often far more birds in the stringybark than previously thought. Participants are encouraged to organise their own search group (i.e. family, friends etc), however there are often opportunities for single volunteers to join in with other search groups. What time is best to search for the cockatoos? Volunteer search groups can search their allocated site at any time during the day of the count; however staff suggest searching up until midday and/or from 3pm until dusk. This is when the birds tend to be more vocal and visible. Do you need any prior experience searching for birds? No, participants do not require any prior experience to assist with the annual count, although we do ask all volunteers to become familiar with what Red-tails look and sound like, as they can often be misidentified with the more common Yellow-tailed Black-Cockatoo. More information can be found by clicking here. How to identify stringybark forest apart from other eucalypt woodlands (i.e Manna Gum). Staff are also happy to answer any other questions participants have in regard to the count and what is required on the day. Participants will need a set of binoculars, and are encouraged to travel in a 4WD as many of the tracks to be searched are located in sandy soil. All volunteers that register to participate will need to complete an activity declaration form (covering OH&S) and will be provided with an information pack containing a map of their search area, a record sheet, and survey instructions in the last few weeks leading up to the count. Each year following the count, the Red-tail Recovery Team hosts an informal campout and BBQ tea at Baileys Rocks, near Dergholm State Forest. This provides a great opportunity to catch up with other volunteers and compare tales of the days’ adventures. Volunteers are required to BYO food, drink and camping gear. How do I register to become involved? To find out how to register for the annual count please click here. The success of the count relies heavily on sighting information staff receive in the months and weeks leading up to the count. Anyone that sees Red-tails is encouraged to report their sighting to freecall 1800 262 062 or by clicking here. BirdLife Australia and the Red-tail Recovery Team values the incredible effort of all our wonderful volunteers to help search for the cockatoos.